Music history will show that there have been a multitude of recordings inspired by personal tragedy. It can provide often beautifully poignant results but can equally lead to suffocating bleakness that is simply too painful to bear. After the devastating loss of his girlfriend, London-based journalist, photographer and musician Rick Senley then had to contend with his own physical problems too and ‘The Long Sleep’ resulted from a period whilst he was learning how to walk again. Thankfully, given Senley’s gifts for painting a picture with his delicate arrangements, the musical document of this testing period is actually a pleasure to listen to. ‘Music For Voyeurs’ gets off to an incongruous beginning with what seems like a relaxation tape with motivational words and a gentle harp melody. Then there’s ‘Probably Time To Go Now’ and ‘September’; tracks which marry relationship guidance advice with chiming guitar seemingly plucked straight out of the Durutti Column and July Skies’ handbook of introspective key changes. Gradually, this initially odd mix of dialogue and music begins to make sense. There’s more than a hint of The Montgolfier Brothers’ melancholy and nostalgia on the sad piano motifs forming the basis for ‘Broomstick Night Electric’ and ‘Someone Else’s Life’ whilst there’s a real sense of loneliness and faded romance on the beautifully played and narrated ‘Jane’. ‘Tonight Will Be My Birthday’, meanwhile, contains the refrain of “don’t worry about it” but one senses there really is (or was) a lot to worry about. Senley’s promise that this album is “the sound of giving up on life but without the courage, a coward’s lament” is not going to be the most obvious way to convince listeners to be drawn in but one can hear hope amidst all the apparent sadness and pretty melodies. 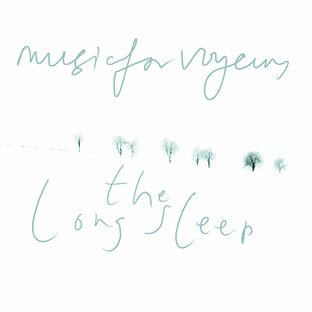 ‘The Long Sleep’ may, at times, be too reverential to its influences but Senley has crafted a very tuneful, varied and complex set of compositions which warrant repeated listens.